The following are Avionté's recommendations for correcting data and producing proper ACA reporting. Consult legal counsel or your broker for questions regarding insurance offerings or ACA compliance. See Correcting 1095-Cs for more information on how to correct specific issues. See ACA FAQ - Configuration for additional information on additional information on setting up ACA fields. Information does not populate when running the 1095 C Report. Data must be generated or regenerated from the Reports tab in the ACA Companion application. Navigate to the Report preparation tab in the ACA Companion application. Select the proper reporting year from the drop-down in the upper left corner. Click Generate Data or Regenerate Data for each supplier row. An additional window will populate displaying the 1094 C information for that supplier. Verify the information and make any necessary changes. Click Generate. Once complete, the data is now available for reporting. The system does not produce a form for an employee believed to be ACA eligible. Avionté produces a 1095-C for any employee who was marked as ACA full-time (worked at least 30 hours per week on average) or enrolled in a self-insured plan throughout the reporting year. An employee is considered full-time from the moment they are set to Yes for ACA Eligibility in the Employee > Payroll > ACA Eligibility screen in the Avionté application. You can also view the audit log of changes to an employee's ACA Eligibility by going to Actions > Employee Log on the employee's record. If the employee was never set to Yes for ACA Eligibility throughout the reporting year, a form will not be produced. Employees who are not full-time, but were enrolled in a self-insured healthcare plan at some point in the reporting year will also receive a 1095-C. This is indicated by an employee having an enrollment for a self-insured plan on his or her Employee Plan Details tab. Plans are indicated to be self-insured or fully-insured in the Insurance Plan tab of the ACA Companion Application. Employees who fall into this category will likely show a 1G in the All 12 months box of the 1095-C per the IRS 1095-C Instructions. Employees also need at least one paycheck in the reporting year. If the employee was never paid out of Avionté in the reporting year or is a 1099 employee, he or she will not receive a 1095-C. The employee was not set to "Yes" for ACA Eligibility at some point throughout the reporting year. Contact Avionté support with the employee(s) IDs to have this audit inserted. The employee was marked as enrolled in self-insured coverage within the reporting year. The employee's enrollment can be edited and/or updated on the ACA Companion application's Employee plan details tab. The employee was not a W2 employee or was not paid out of Avionte in the reporting year. Avionté will not be able to support the creation of the employee's 1095-C. You can complete a form for the employees manually or via another vendor. An employee received a 1095-C when they should not have. Erroneous creation of 1095-Cs often occurs due to improper setting of the employee's ACA Eligibility status. If an employee's ACA Eligibility status was changed to Yes at some point in the reporting year, that employee will be considered full-time as of the date of the change. Unfortunately, there is no way to remove or change this from the front end of the application, so please contact Avionté with a list of Employee IDs affected, and we can remove the full-time indicators to remove these employees from your list of employees receiving 1095-Cs. The employee was set to "Yes" for ACA Eligibility at some point throughout the reporting year. Contact Avionté support to have this audit removed. The employee has an enrollment for self-insured coverage within the reporting year. The employee's enrollment dates can be verified and/or updated on the ACA Companion application's Employee plan details tab. The Coverage Dates fields will indicate when the system is considering the employee enrolled. If the employee is no longer enrolled in this plan, change the end date of the self-insured healthcare deduction to the date the employee terminated their coverage on that plan. The offer of coverage code displaying in Line 14 (1A-1G) is incorrect. This code is defined in the Offer of coverage code field in the Insurance plan setup tab. If you offer multiple plans to an employee, the system will use the code of the "best" plan in your Benefit Package offered to an employee (The closer to the beginning of the alphabet, the better the plan). For individual or unique employee situations, this code can also be overridden at the Employee level in the Avionté core application. Note: For more information on overrides, see 1095-C Part II Overrides. From the Main Menu, navigate to Front Office > Employee. Click Extra from the sub-menu. Under the "Enter New Here" panel, select the Label of "1095-C Line 14 Override." Enter in the value as required. For information on the specific formatting, please see the article linked above. An employee was offered healthcare but their Line 14 shows 1H for all months. An offer needs to be recorded in the employee's Employee Plan Details section of the ACA Companion Application in order for Line 14 to display your Offer of Coverage Code. See the Employee Plan Details instructions for more information on how to enter this information manually. If you need to enter offers and/or declinations for a large amount of employees, Avionté recommends using the ACA Companion Declination Export AQ and the ACA Import to mass insert declinations onto employee's forms. 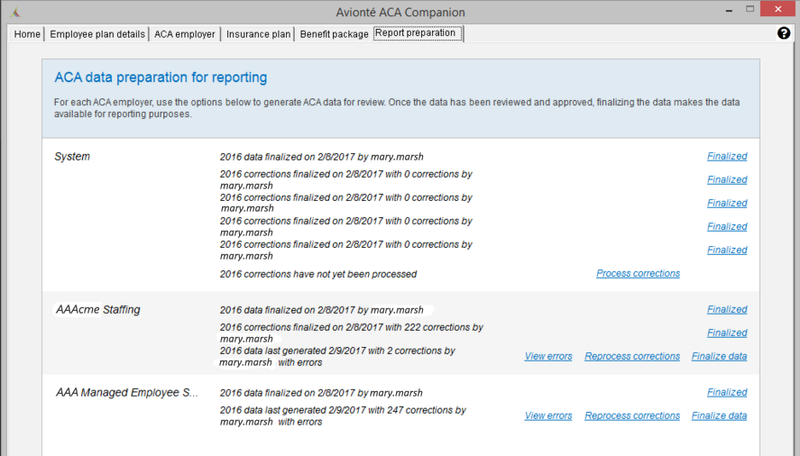 Once entered, be sure to Regenerate Data in the Report Preparation tab of the ACA Companion to see reports update. The dollar amount showing on an employee's Line 15 is incorrect. The value is defined in the Insurance Plan tab of the ACA Companion Application. For more information on how to set this value, see the Insurance Plan tab documentation. The value can also be overridden at the Employee level. Under the "Enter New Here" panel, select the label of "1095-C Line 15 Override." Enter in the value as required. Line 16 on an employee's 1095-C is showing 2A, even for months that they had an assignment. The system recognizes an employee as employed if they have an assignment on record with a Performance Code whose CountAsAssigned property is set to "True." This will allow the system to ignore assignments that may have been created by accident or deleted. In the Admin Tools window, select "System" and "Config Choice." In the "System | Config Choice" window, select the "ChoiceProperty" tab at the top. Select the "AssignmentPerformance_Temp" from the category drop-down menu. In the "CountAsAssigned" column, ensure that any performance codes that imply work was completed are set to "True." Codes such as Deleted or Mistaken can be set to "False." When generating report data, errors appear stating "Employee has one or more months that did not meet any of the conditions for Code Series 2." The error means that the employee has a month where Line 16 is blank on his or her 1095-C form. Blanks can be valid in Line 16 on the form, which is why the errors are set to a Warnings that you may ignore if necessary. A blank will occur in Line 16 if an employee declined the offer of a plan, and that plan did not have a Safe Harbor code setup in the Insurance Plan tab of the ACA Companion. A safe harbor code is optional and not required on a 1095-C unless it applies to you. If there is no Safe Harbor code entered into the Insurance Plan section, it is highly possibly (and valid) that some employees will have blanks in Line 16. If you believe the blank to be correct (you aren't using a Safe Harbor code to determine affordability of your plan) you can ignore the errors and proceed to viewing your forms via the 1095C Report or 1095 C AQ. If you feel some blanks need to be corrected, you can use a 1095-C Line 16 Override to manually adjust Line 16 values. Here is an article walking you through the override process: [1095-C Part II Overrides](https://support.avionte.com/hc/en-us/articles/235755828-1095-C-Part-II-Overrides). Employee is considered non-full time for that month and/or was terminated during that month. 2B will populate in January if healthcare deduction/contribution starts on or before 1/5/2015 (the first payroll of the year). A healthcare deduction is touching that employee's record for the full month. Employee is in their initial measurement or admin period. 2D will stop populating once the employee is considered full-time. Populates the value input for Supplier property GSACA_1095CLine16Value when none of the above conditions are met. Part III of employees' 1095-Cs contain no data. Part III of the 1095-C should only be completed if the employee is enrolled in self-insured coverage. Dependent information will only show if the Is this a self-insured plan option is set to "Yes" on the Insurance plan setup tab for the associated plan. If the coverage is self-insured, the dependent information will pull from the Covered Individuals section of the Employee Plan Details tab. The employee will be listed in addition to their covered dependents and/or spouse. For more information, see the Employee Plan Details documentation.